At the invitation of President of the Republic of Chile Michelle Bachelet Jeria, Vice Chairman of the 12th National Committee of the Chinese People's Political Consultative Conference Ma Peihua will travel to Chile to attend the presidency handover ceremony as the Special Envoy of President Xi Jinping from March 10 to 11. Q: According to reports, ROK National Security Director Chung Eui-yong stated that US President Donald Trump said that he would meet with Chairman of the Workers' Party of Korea Kim Jong-un by May. What is your comment? A: We welcome the positive messages conveyed by the US and the DPRK on direct dialogues. The Korean Peninsula nuclear issue is moving in a right direction towards its settlement. We fully commend and support the efforts made by all relevant parties to resolve this issue through dialogue and consultation. Just as Foreign Minister Wang Yi said at yesterday's press conference, to return peace and stability to the Peninsula and the nuclear issue to the track of settlement through dialogue, these initial steps must be followed up by corresponding and concerted efforts by all relevant parties. Foreign Minister Wang Yi also pointed out in particular that every effort must be made for peace, and the opportunity must be seized. We hope that all relevant parties can demonstrate political courage and make a political decision to expeditiously carry out all necessary and useful engagements, both bilateral and plurilateral, and do their best to restart dialogue and negotiation for the peaceful settlement of the nuclear issue. China will continue to make unremitting efforts for this outcome. Q: According to reports, the ROK side said that following the National Security Director Chung Eui-yong's visit to the United States, it would send other officials to Japan, Russia and China. Can you give us details as to when the visit to China might happen and who might be coming and whom they might meet in China? A: We will keep you posted if we have any relevant information. Q: Regarding the Korean Peninsula issue, China has kept saying that it will play its part. Does China plan to chair or host the summit meeting between the DPRK and the US? A: As a close neighbor to the Korean Peninsula and an important party to the Korean Peninsula issue, China is committed to advancing the denuclearization of the Peninsula, upholding the peace and stability on the Peninsula and resolving the issue through dialogue and consultation. The efforts made by China in this regard are there for all to see. We welcome and support the detente on the Korean Peninsula and the positive interactions between the DPRK and the ROK as well as between the DPRK and the US. We hope that the reconciliation and cooperation between the DPRK and the ROK and the dialogue and consultation between the DPRK and the US can make positive progress. We hope that all relevant parties can continue with their efforts for the political settlement of the Korean Peninsula issue and the enduring peace and security of the Peninsula. China will continue with its positive role to this end. Q: According to reports, there has already been a contact between the US and Japan following President Trump's statement that he would meet with DPRK leader Kim Jong-un. Has there been any communication between the US and China with regard to this potential summit? A: China and the United States maintain close communication at all levels, including on the Korean Peninsula issue that you all pay great attention to at the moment. We will keep you posted if we have any important information in this regard. Q: It is reported that the Argentinean government has called for the capture of five Chinese fishing boats that were said to be involved in illegal fishing in Argentinean waters. Can you confirm this? A: I am not aware of the information mentioned by you. I can check it out for you after the press conference. Q: You mentioned the role China has played in resolving the Korean Peninsula issue through dialogue and consultation. Specifically, what role do you think the sanctions have played in this aspect? Considering that China is the most important trading partner of the DPRK, how important has China's application of the sanctions been about? 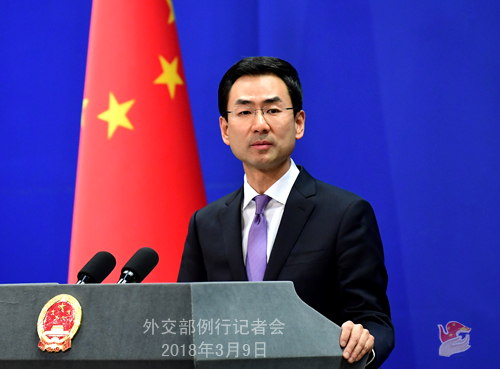 A: For a long time, China has been implementing the DPRK-related resolutions adopted by the UN Security Council in a comprehensive and strict manner and we have paid a huge price for that. In spite of this, China will one-hundred percent discharge its due international obligations. Meanwhile, we have emphasized many times that sanctions are only the means rather than the end and that only resorting to sanctions can by no means realize the denuclearization of the Peninsula. The Korean Peninsula nuclear issue, in the final analysis, should be resolved through such political and diplomatic means as dialogue and negotiation. The pressure caused by the sanctions should be turned into the driving force for negotiation in a timely manner. We are heartened by the current momentum of amelioration on the Korean Peninsula. We hope that all relevant parties can act on the principle and spirit of the Six-Party Talks and the September 19 Joint Statement, address their legitimate concerns in a synchronized and reciprocal way and make efforts for the political settlement of the Korean Peninsula issue and the enduring peace and security of the Peninsula. China will continue with its positive role to this end. Follow-up: I know it's still early stage at the moment and a fellow correspondent asked whether China would welcome the chance to host this meeting here. Is it too early to say? Would China consider that option? A: As I said just now, the efforts made by China over a long period of time to resolve the Korean Peninsula nuclear issue are there for all to see. 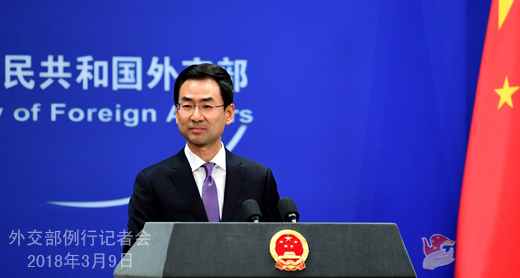 China is willing to continue with its positive role in this regard. Q: Recently, the English version of the Global Times cited a Chinese scholar's view that China is willing to provide assistance as the Philippine government proposed a large-scale investment plan to develop its economy. The loans provided by China are usually accompanied by repayment agreements, which will use certain natural resources as collateral. Could you confirm that? And the Philippine media said that China provides loans with terms that require the Philippines to compromise on the South China Sea issue. What's your comment on this? Since the turnaround of China-Philippines relations in 2016, China has been actively helping the Philippines develop its economy and improve people's livelihood, and we have given our full support to President Rodrigo Duterte's large-scale infrastructure program "Build, Build, Build". The Chinese government and financial institutions have also provided financing support to the Philippines, including preferential buyer's credits, and assisted the Philippines in issuing the panda bonds, which effectively ensured the implementation of relevant projects. By convention, parts of China's concessional loans require the borrowers to use certain sovereign credit as collateral, which is an international practice. China has never asked and will never ask relevant countries to use natural resources as collateral in loan agreements. In this vein, our assistance and support to the Philippines are provided with no strings attached. To properly resolve the South China Sea issue is the basis and important guarantee for the sound and steady development of China-Philippines relations, but China will not link the South China Sea issue with bilateral economic and trade cooperation projects. 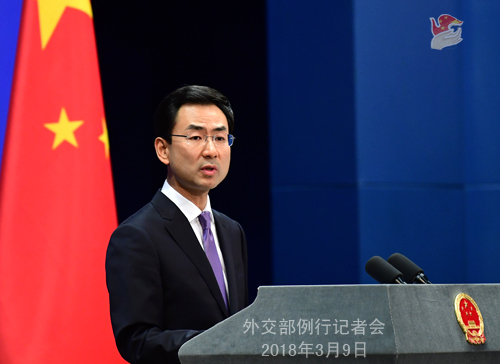 China stands ready to work with the Philippines to follow through on the consensus between the two leaderships and stay committed to properly resolving differences through dialogue and consultation, ensuring the sound and steady development of bilateral relations and jointly upholding regional peace and stability. Q: With regard to the Korean Peninsula issue, the "suspension-for-suspension" as proposed by China was realized during the Pyeongchang Winter Olympics, so was the inter-Korean dialogue, something that China has been calling for all along. There will soon be contact between the DPRK and the US. Could you tell us what the role China is playing for now? A: You are quite clear about China's stance. (The journalist smiled) Yesterday, Foreign Minister Wang Yi pointed out at the press conference that, during the Winter Olympic Games, the DPRK did not conduct any nuclear and missile test and the US and the ROK suspended their joint exercises targeting the DPRK. This proves that China's "suspension for suspension" proposal was the right prescription for the problem and created basic conditions for the improvement of inter-Korean relations and current momentum of amelioration on the Peninsula. China has stressed many times that the core of the Korean Peninsula issue is about the contradiction between the DPRK and the US. As parties directly concerned, the DPRK and the US should conduct dialogue sooner rather than later to enhance understanding and build mutual trust. We are pleased to see the DPRK and the US finally took this step forward. Like what I said just now, we hope that all relevant parties can address their legitimate concerns in a synchronized and reciprocal way with a view to contributing to the political settlement of the Korean Peninsula issue and the enduring peace and stability of the Peninsula. China stands ready to continue with its positive role to this end. Q: According to reports, the US has decided to impose restrictions on steel and aluminum imports. I know that the Ministry of Commerce has issued a statement on this. Does the Foreign Ministry have any comment on that? A: This morning the Ministry of Commerce has responded to that. 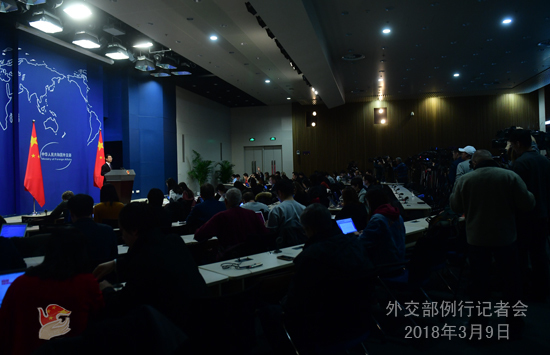 Foreign Minister Wang Yi also elaborated on China's position on China-US relations, including the economic and trade issues between the two countries in his press conference yesterday, so I'm not going to restate that. Q: According to our information, officials from the Cheong Wa Dae are set to visit China to brief the Chinese side on the meeting between President Moon Jae-in's special delegation and the DPRK leader Kim Jong-un. Do you have more details on that? Which Chinese official will meet with them? A: I already took this question just now. We will release relevant information in a timely manner when we have it.